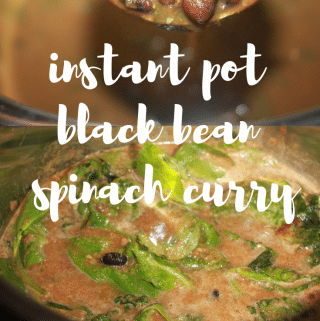 This instant pot black bean curry with spinach and spices is a vegan recipe without oil and its a healthy low fat vegetarian/vegan instant pot black bean curry recipe. This healthy, low fat, delicious and vegan black bean spinach curry will go great with cooked brown rice or white rice for a vegetarian/vegan lunch or dinner. Black beans is very healthy and makes a great vegetarian/vegan protein source so if you are following a vegetarian diet or vegan diet you can try to include protein rich beans in your diet. Black beans is one such healthy beans which can be used in a lot of recipes including vegetarian curry recipes, salad recipes etc. Try this quinoa black bean salad recipe using cooked black beans and cooked quinoa, which is so easy to prepare, healthy, delicious and vegan. 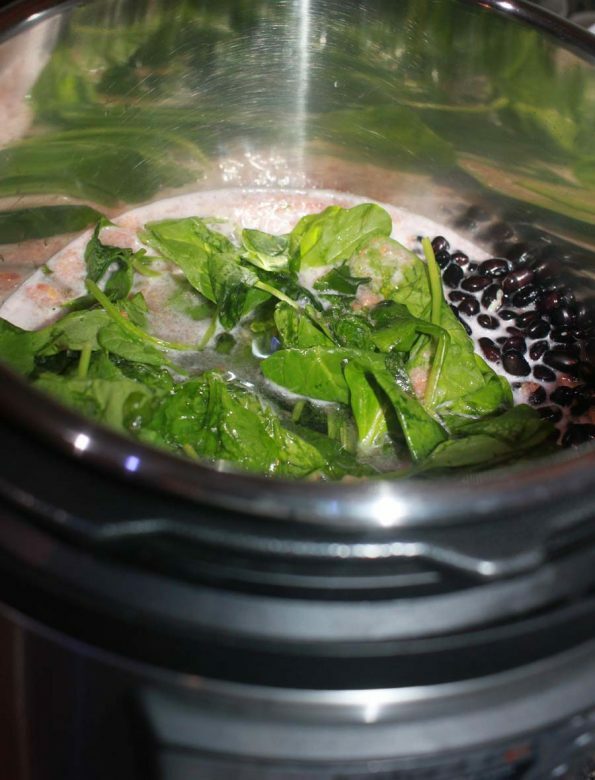 If you have an instant pot, read this post on how to cook black beans in instant pot here. 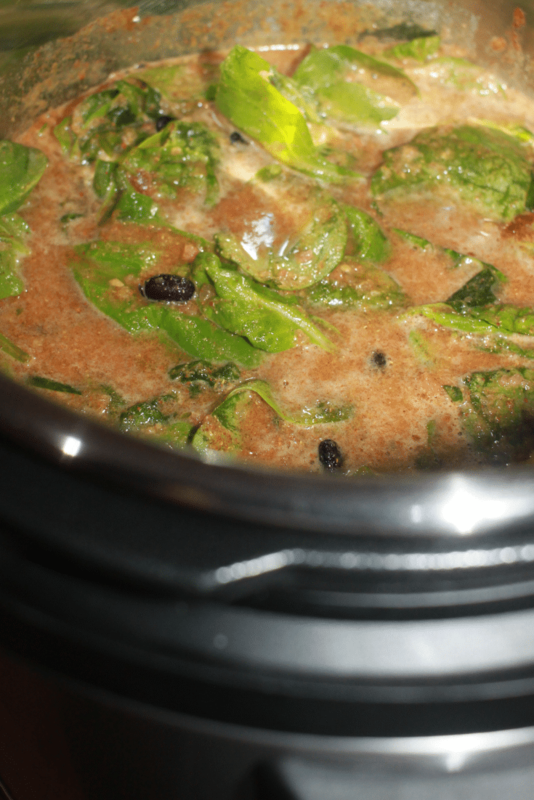 This black bean curry with spinach leaves and spices is very delicious and very healthy as well and its so easy to prepare this black bean curry in instant pot. If you love the idea of combining beans and spinach leaves in a curry, also try this chickpea spinach curry made using pressure cooker which is also very easy to make, healthy and very delicious too! 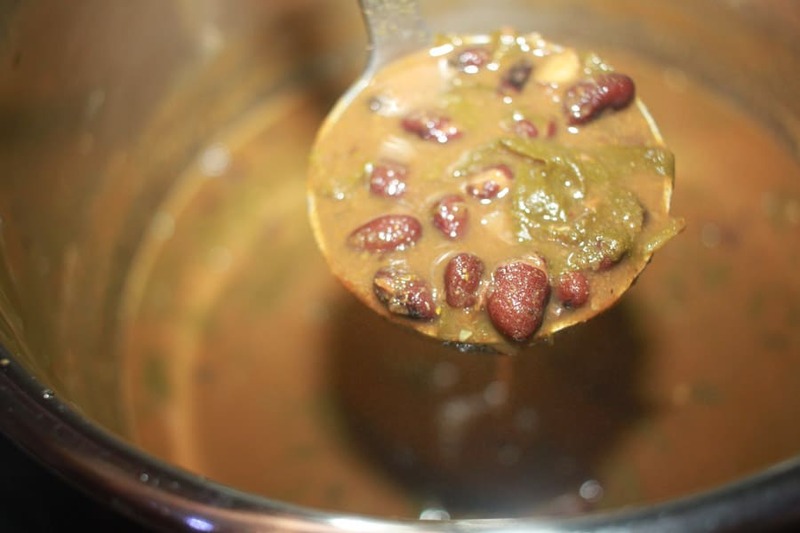 The combination of black beans and greens is super healthy, filled with nutrients and is delicious and you can try different combinations of beans and greens to make different dishes easily so there will be lots of varieties. 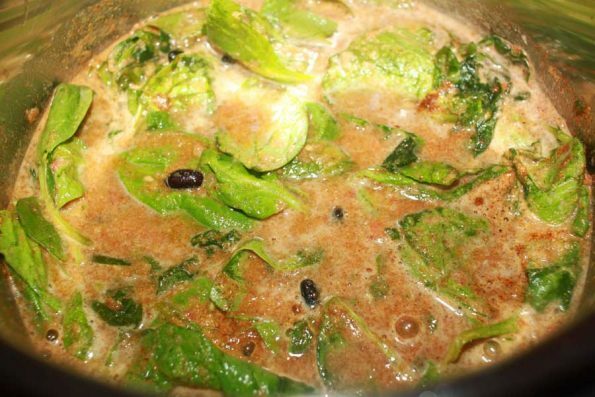 This black bean mustard greens curry is another great combination of black beans and greens which is prepared by pairing black beans with fresh mustard green leaves and spices, and it is very delicious, easy to make and healthy too! That’s why I told once you get the idea of pairing beans with greens, you can try different combinations so you can enjoy different kinds of beans and varieties of green leaves in healthy, delicious combinations. So here is how you can make this easy, delicious and healthy black bean spinach curry following this easy black bean spinach curry recipe. Inspired by the Mexican black bean dishes, this Indian style black bean curry is blended with spices and green spinach leaves for a healthy, delicious combination. 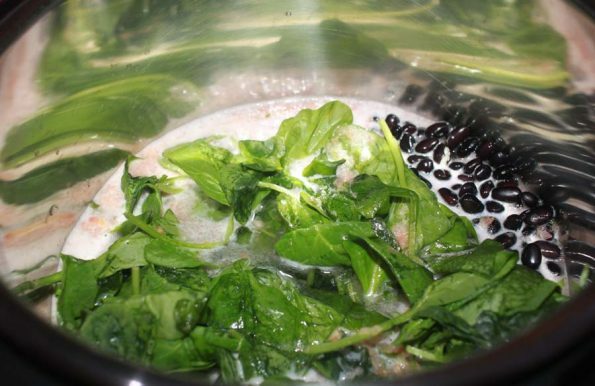 Wash the black beans and soak in enough water for about 5 to 6 hours or overnight. After soaking, discard the water used for soaking and rinse the black beans again in fresh water for 2 to 3 times. 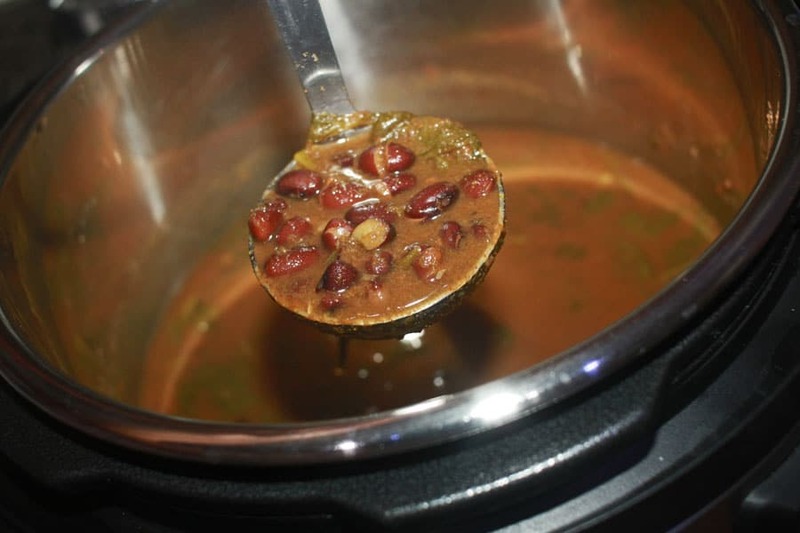 Transfer the black beans to the inner pot of instant pot. Also add washed spinach to the inner pot.In a blender, add tomatoes, green chilies and 2 cups of water and blend to make the base of the gravy. Transfer this grind mixture also to the inner pot. Add the remaining 2 cups of water, enough salt and all the spices to the inner pot, mix everything well. Cover the instant pot with lid in sealing position, press manual and cook in high pressure for 7 minutes. It will take a few minutes for the instant pot to build up pressure and start the cooking, so you will need to sit back and wait until the cooking is done. Once the cooking is over, the instant pot will beep. Once the cooking is done and instant pot beeps, press the 'keep warm/cancel' button and wait for the instant pot to naturally release the pressure which will take another few minutes of time.Once the pressure is all naturally released, carefully open the lid by turning to the venting position. If you wish to thicken the gravy further, press the saute function, adjust to high and simmer for another 2 to 3 minutes. The delicious, easy and healthy vegetarian/vegan black bean spinach curry is ready to serve! Enjoy the black bean spinach curry with rice, quinoa or anything as you wish for lunch or dinner. Instead of garlic powder, you may use 2 to 3 cloves of fresh garlic which can be blended along with the tomatoes or you can crush them and add to the curry. You may also use a small one inch piece of peeled ginger, which can also be added to the blender while making the tomato mixture or you can use ginger powder also if you wish. If you want to retain the bright, green color of spinach leaves and want to enjoy a fresher, crispier texture for the leaves, you can add the spinach leaves after the initial cooking is done in the instant pot (before simmering the contents). 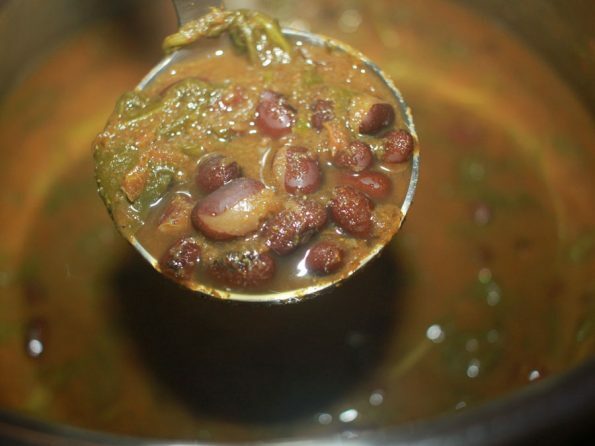 I added the leave early for this recipe, so the leaves got cooked along with the beans allowing the flavors to blend in more. Based on your preference, you can do it both ways. 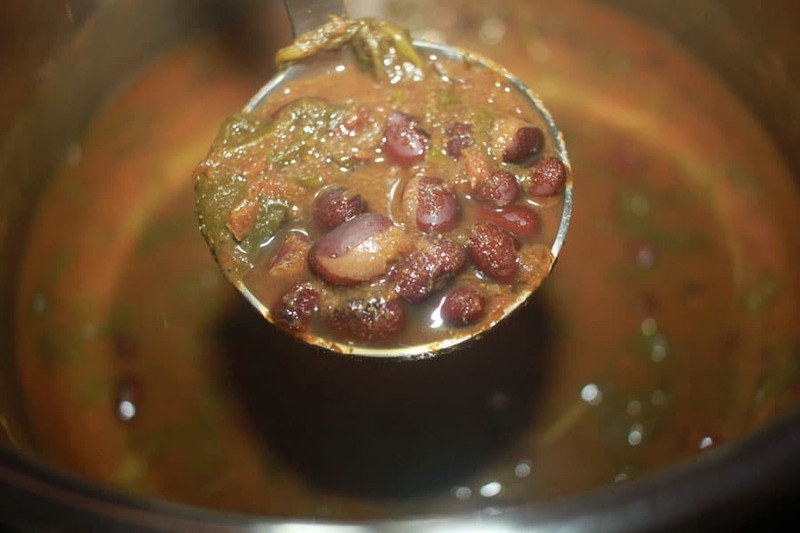 In this chickpea spinach curry recipe (in pressure cooker), I added the spinach leaves later on to retain the color and texture of the spinach leaves. 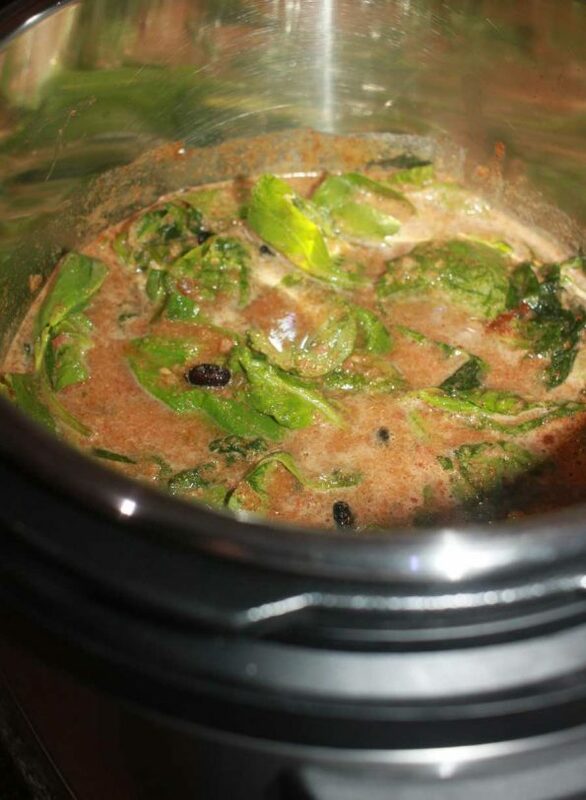 Hope you found this post on instant pot black bean spinach curry helpful in making easy, healthy and yummy black bean curry using instant pot.